From time to time, IELTS candidates may be given a diagram where they will have to describe the process of something. This means that you will have to write about how something happens, in stages. In a writing task like this, explaining why something is done is given less importance compared to how it is done, so if a reason is not provided in a diagram (eg. why 15% of cement is used), do not assume that you know the reason for this and write it down (eg. 15% of cement is used because if there is less cement, the concrete will not be strong). If the information is not there in the diagram, do not write it. 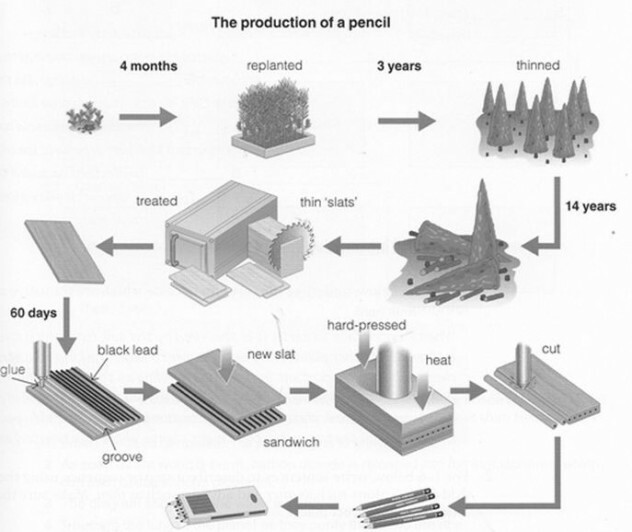 Here is an example diagram of how pencils are manufactured. Note that the diagram shows what happens, not why it happens. How are you going to describe this process? Have a look at the video below and the description that follows it. You will see that some reasons are provided at certain stages. However, this is not mentioned in the diagram. [00:36] Making a pencil 1) _____ with a mixture of graphite, carbon powder derived from coal and a smaller amount of clay. A 750 pound mix of graphite carbon clay and water are 2)_____ into this ball mill, filled with river stones. The ball mill 3) _____ the ingredients for 24 hours until they form a smooth homogenous slurry. General Pencil 4)_____ the slurry into filter presses which screen out the water and 5)_____ the mix into manageable sections, known as cakes. Cakes are left to dry for 48 hours. After the carbon cakes are 6)_____ to a very fine powder and recombined with water, the mixture is ready to be extruded into the pencil shape’s cores or leads. Once the pencil cores are extruded out and 7) _____, the workers place them into the crucibles which are 8)_____ into a furnace. On top of the crucible, they 9)_____ a packing graphite to make sure that the oxygen does not get down to leads, the cores themselves that burn out the carbon. To make the pencil shells, first, a saw 10)_____ eight grooves into each slat of cedar. The graphite cores are 11)_____ into one slat and covered with another, forming a sandwich. Once 12)_____, the slats are cut into round or hexagonal pencils. The pencils are then sanded and 13)_____, fitted with a brass eraser holder and the erasers themselves. They are also 14)_____ with letters or numbers that indicate the pencil’s degree of hardness versus blackness. As you can see, most of the missing words are verbs. 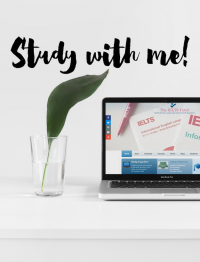 When describing a process in IELTS Writing Task 1, it would be a good idea to substitute the verbs that you see in the task diagram with your own verbs that have similar meanings. Can you replace the missing verbs above with other suitable ones? Next time you pick up a pencil to do your IELTS Writing Task 1, think carefully about how it’s made.